The Tuscan agricultural company Santa Lucia in Faulle, which uses eco-sustainable systems for mobility and production, has chosen the Alke' ATX200E as a vineyard tractor. 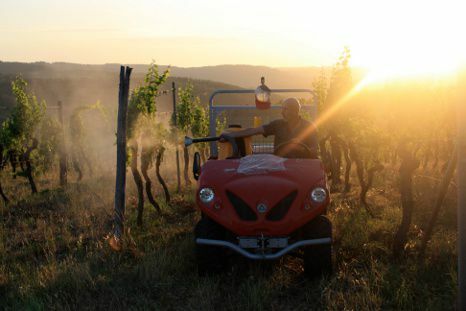 The Santa Lucia in Faulle winery, situated in the Chianti region of Tuscany, uses an Alkè ATX200E vineyard tractor. We asked the owner a few questions in order to understand why he chose an Alkè vehicle and how the vineyard tractor is used. Why did you choose an Alkè electric vineyard tractor? What requirements did your vineyard tractor have to satisfy? What do you use your ATX200E for? Can you tell me what you think about the vehicle? What are the features of the vehicle that you appreciate the most? What are the problems you have managed to solve? How many hours a day do you use the vehicle? In what does biodynamic production, like that you use, consist? What are the rules? What type of vehicle did you use before the Alkè vineyard tractor? Do you use other electric vehicles? For what purposes? After having realised a 20 kW photovoltaic plant, the decision to pass to electric vehicles and equipment came naturally. In particular, in this case, we chose an Alkè vehicle because I like the fact that it is an Italian product (design, prototype, production and after-sales are all managed by the manufacturer, Ed). We were looking for a good off-road vehicle, which works well on slopes, has a good load capacity and which is easy to drive.What do you use your ATX200E for? We use the vehicle for transporting various objects, when treating the vines and during the harvest to transport the crates of grapes. Moreover, thanks to the fact that it is so silent, it is used to track down and scare off roe deer, which cause damage to the crops. It operates really well; we all find it very easy to use. Coupled with the photovoltaic plant it is very convenient. Handling (the ATX vehicles are 1.27m wide, Ed) and easy driving. We have managed to reduce pollutant emissions and noise. We have also improved working conditions for the operators, as with this electric vineyard tractor the problem of overheating engines no longer exists and operations are much cleaner. 6/7 per day in the harvest period, otherwise 2/3 hours per day. Biodynamic cultivation is a method where you work in harmony with nature, preferring a conscious use of natural forces and respect for biological equilibrium, without using a lot of crop protection products. For example, allowing the grass to grow in the vineyard, and no use of fertilisers or manures. We are therefore in a close relationship with the surrounding environment. What type of vehicle did you use before the Alkè vehicle? We used a diesel pick-up and small diesel tractors. We have a hybrid car, a Toyota Prius and some electrical equipment such as the mulcher for example. We would like to thank Santa Lucia in Faulle winey for the interview.